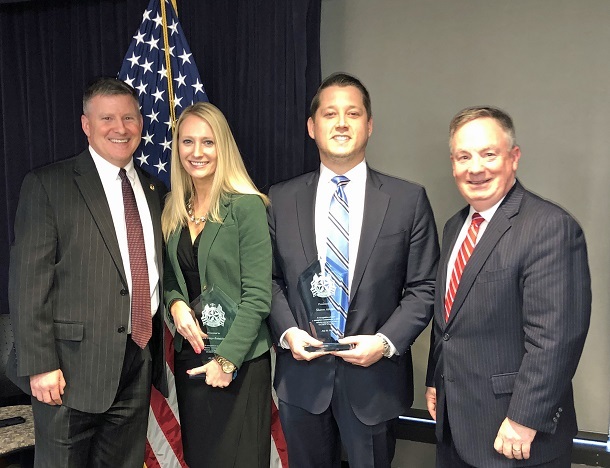 United States Attorney Bill Powell is proud to announce that three Assistant United States Attorneys in the Northern District of West Virginia were recognized Tuesday in Baltimore for their work to combat the opioid epidemic. Assistant U.S. Attorneys Shawn M. Adkins, a Bridgeport High School alum, and Lara K. Omps-Botteicher, along with former NDWV Assistant U.S. Attorney Anna Z. Krasinski, now with the U.S. Attorney’s Office in New Hampshire, will be recognized at the Organized Crime Drug Enforcement Task Force Awards for their exemplary work on cases involving opioid reduction in the Northern District of West Virginia. “Our honored Assistant United States Attorneys and law enforcement agents are extraordinarily hard working and professional. They come to work every day with one mission: to protect the people of this district. They do so with great enthusiasm, a just mind and without any concern for recognition. But, when recognition comes we should embrace it for it reminds us how fortunate we are to have them helping to protect each of us. I am proud to be associated with them, and congratulate them all on this well-deserved recognition,” said Powell. Along with Adkins, Omps-Botteicher, and Krasinski, several other Northern District of West Virginia law enforcement professionals were recognized at the ceremony. The Organized Crime Drug Enforcement Task Forces (OCDETF) Program was established in 1982 to coordinate a comprehensive attack against organized drug traffickers. Today, the OCDETF Program is the centerpiece of the United States Attorney General’s drug strategy to reduce the availability of drugs by disrupting and dismantling major drug trafficking organizations, money-laundering networks, and related criminal enterprises. OCDETF combines the resources and expertise of federal law enforcement agencies in a coordinated attack against major drug trafficking and transnational criminal organizations. The OCDETF program includes the 94 U.S. Attorneys’ Offices (USAOs), the Bureau of Alcohol, Tobacco, Firearms and Explosives (ATF), the Drug Enforcement Administration (DEA), the Federal Bureau of Investigation (FBI), the Internal Revenue Service (IRS), the U.S. Coast Guard (USCG), the U.S. Immigration and Customs Enforcement (USCIS), the U.S. Marshals Service (USMS), the Criminal and Tax Divisions of the U.S. Department of Justice, and numerous State and local agencies.